During a crabbers crabbing experience one may find themselves faced with a situation of needing to care for a severely handicapped or mutilated hermit crab. Do not despair, it is possible to care for a him so he can regenerate his missing limbs in hopes of having a successful molt. To do so will require extra TLC, time and patience. Within the isolation tank place a dry sand substrate to limit the possibility of a mold complication in case the hermit crab would have any left over food on his shell or body after feeding. If this is not possible, one can get a small cleaned bowl and place dry sand within it and push this down into the original substrate in the iso, but should be large enough one can place a hut over the bowl. (or get a Tupperware type lid, a clean margarine lid and place dry sand within it) Do not use dry coco fiber, eco earth or a substrate that does require to be used damp so not to pull moisture from the hermit crab. Make a small impression within the sand to place the hermit crab in. The isolation tank should have a regular night and day cycle up until one notes the gel limbs becoming larger and formed. 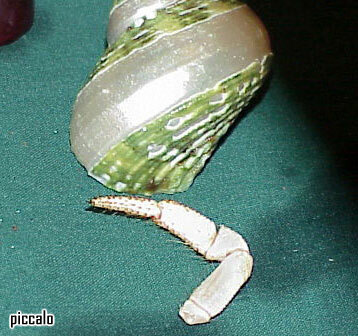 When this is noted, the handicapped hermit crab should have darkness so his molting hormones can kick in. This can be accomplished by placing cardboard, or a towel on the outside of the tank. Carefully attempt to offer him a drop of honey which is natures natural antibiotic. Next, with a dropper if possible, gently take the hermit crab and place 1 drop of dechlorinated ocean/sea water with 1 drop of dechlorinated fresh water within his shell. (if the hermit crab is larger, the size of a 50 cent piece place 2 drops of ocean and 2 drops of fresh water within his shell) After placing the drops of water within his shell, carefully place him in the sand impression you made and cover him with the hut. If he had molted, place his exo within the impression in the sand with him. Leave him be to destress for at least 12 hours, or until the next morning. If he is limbless he will need your assistance in eating, as well as providing him with the water he needs. After permitting him to destress, take part of his exo and crush this into a powder form. Take a drop of 100% pure honey and mix a little of the exo within it to make a mushy paste. (If he hadn’t molted read regarding foods to offer later in this article, also making them into a mushy paste type food) Once the exo/food is prepared have a place ready where you can sit to take the time needed to feed him. Use a toothpick, or something small that you will be able to control easily and place a small drop of the mush on the end of it. Gently and carefully place the food where his maxillipeds (mouthparts) are and wait patiently for him to begin to eat the food. If he shows no interest in the food, you may need to gently touch his maxilliped area with the food to get his interest for him to begin to eat. If you watch closely you should be able to tell when he has had enough to eat, so stop offering the food so not to stress him more than he already is. (this is normally after he has cleaned the toothpick twice from the food you’re offering if he is a smaller hermit crab, if he is a larger hermit crab it maybe after 3-4 offerings) If you have gotten any of the food on his shell, clean this carefully with a Q-tip and ocean water. Once you have cleaned his shell of any possible food, you can place him within the ocean water pond for a minute to see if he can fill his shell with some water. (make sure he is not totally submerged, and this can vary, if you place him in the fresh water pond for rinsing, place 1 drop of ocean water within his shell when you remove him from the pond, if you place him in the ocean pond, place 1 drop of fresh water within his shell) Once rinsed, place him back within the isolation tank in the area you had prepared for him and place the hut back over him. Please do not disturb this hermit crab again until evening when you have time to attempt to feed him again. The less he is disturbed, the less unnecessary stress he will have to undergo while he feels in such a vulnerable state. For the evening feeding, make a mush out of his exo with dechlor water. For the morning offering you can mix the crushed exo with dechlor water with a little spirulina mixed in as well if you have any. Attempt to rotate this with each feeding until majority of the exo is gone so he hopefully will continue to eat since hermit crabs are known to ignore foods they had eaten within 9-14 hours before. Once his exo is gone, the feeding must continue on a daily basis in the morning and the evening as well as the cleaning of any excess food off of his shell and the fresh/ocean water dips in the pond. At night prior to you retiring for the day, place 1 drop of ocean and 1 drop of fresh water within his shell so he will have the water he wants/needs. It is very important to offer him wide varied, high quality diet. Please attempt to stay away from the commercial foods unless they are of higher quality and either freeze dried or dehydrated without any preservatives within them. Offer foods that contain copper, lipids, zeaxanthin, bete carotene, high protein source, a high calcium source, chitin, cellulose, spirulina, seaweed, omega fats, Carbohydrates, etc. The above care is provided for a hermit crab who has no limbs and not able to move about himself. If your hermit crab has a 2-3 limbs or more, you may wish to alter some of the care advice above. Observe him closely to see if he is able to go to the food dish as well as the water ponds on his own. This can be done too while you are asleep or away by smoothing the sand and checking it for tracks in the sand. If he is able to move about on his own, the detailed care above can be adjusted accordingly. If you need further assistance, please feel free to complete the Emergency Questionnaire and post it on the forum.